Paul Cook admits this weekend’s trip to Rotherham will not be for the faint-hearted, with his Wigan Athletic players knowing they’ll have to roll up their sleeves and ‘earn the right’ to play. Sixth-bottom Latics travel to South Yorkshire to face the fourth-bottom Millers, with a six-point advantage in the standings. If they are to preserve that buffer, or even extend it, Latics will have to fight every step of the way at the New York Stadium against Paul Warne’s battlers. “First and foremost, to go to Rotherham and win a game of football, you are going to have to go and defend, play well and earn the right,” Cook acknowledged. “In my opinion they are having an outstanding season. “At the beginning of the season, when everyone lays their cards on the table, unfortunately for Rotherham they are dealt the worst hand. “Does that affect Paul and his players? Not a chance. “In terms of work ethic and commitment, and quality at times, they give absolutely everything they have. “When you’re a manager and know that’s what you have in the dressing room – a team that will never lie down – that’s what you want. “Rotherham’s home form is very good, they score a lot of goals in the second half. “I can’t pay Rotherham any more respect than we’re going to do. “As a club they continually...not so much over-achieve, because that’s a bit of a wrong statement...but they probably do better than they’re supposed to. Cook has already confirmed Chey Dunkley will replace Cedric Kipre at the heart of the defence to help combat the Millers’ physical threat. But he also wants his players to be proactive against a side who score most of their goals from set-pieces. 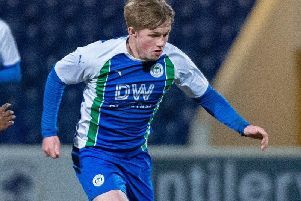 “If we can dominate the ball and dominate the game, they won’t be allowed to play the ball in our half of the pitch,” the Latics manager recognised. “If Rotherham are stronger than us on the day and dominate us, we will have to defend a lot of balls into our box and set-pieces. “Both teams know a win would help their season massively. “If we were to win, it would put us nine points clear of Rotherham – which is a three-game swing. “They’d have to win five of their last 15 games to even get near us. “A draw would maybe suit us more than them, but we’ve seen what wins in this division can do. “I’ve always said that when you’ve won a game, it allows you to come off a pitch and not care at all what anybody else has done. “Every single one of the teams below us would swap places with us at the moment. “Now the focus is on putting the pressure on with a good performance and three points. “We’ve come through a tough set of fixtures, but the set of fixtures in front of us are just as tough. “We’ve got it all to play for – but it’s all in our own hands.